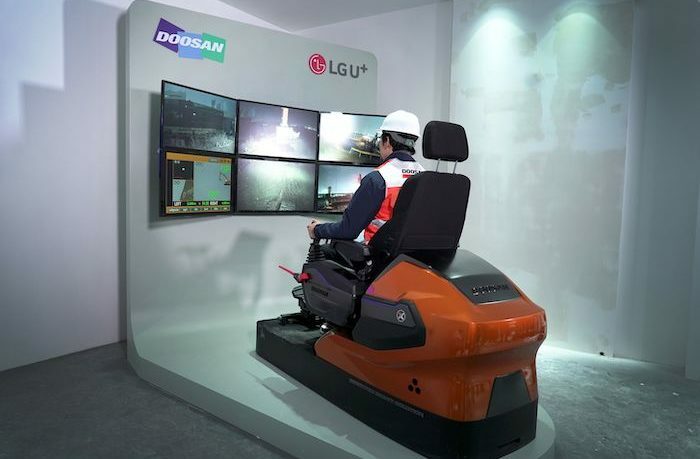 At Bauma 2019, Doosan is showcasing long-distance remote control (TeleOperation) of a construction machine, using 5G technology. Doosan has created the term TeleOperation to describe the operation of construction equipment from a remote station. From an operator booth on stand at Bauma in Munich, Germany, Doosan is demonstrating the remote control of a DX380LC-5 40-tonne crawler excavator located over 310 miles (8,500km) away in Incheon, South Korea. TeleOperation is co-developed with LG U+, the South Korean telecommunications and data services company. The TeleOperation demonstration on the Doosan stand showcases the first remote control of a machine across such a large distance between locations using 5G telecommunications technology. For the TeleOperation to function properly, it is essential for live video streaming to be reliably delivered at the operator’s station with a minimal time lag. With its ultrareliability and low latency (signal delay), the new 5G network overcomes time lag issues in the Doosan system, providing 10 times faster bandwidth and 10 times lower latency than a 4G network. Special features incorporated include a low-latency video transmission module with fast video transfer (including encoding and decoding). LG U+ has also introduced new modules to provide low-latency image processing to further minimize the time delay. 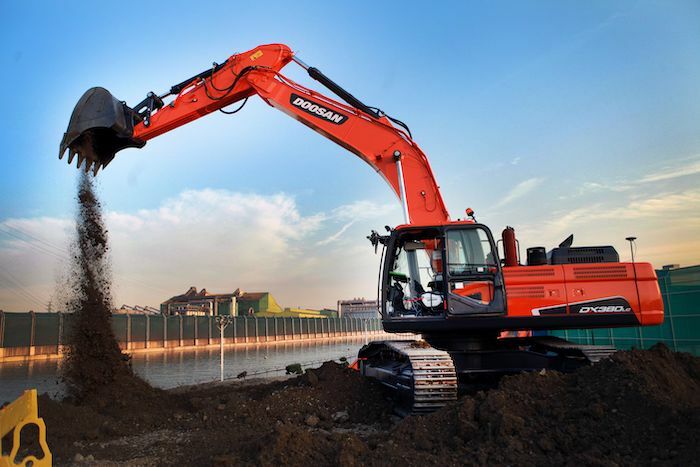 Another factor in creating more effective remote control is the use of Doosan’s innovative electrohydraulic technology in the DX380LC-5 excavator. The DX380LC-5 excavator being remotely controlled at Bauma is a standard machine that allows Doosan to guarantee the performance and the compatibility of third party attachments and other equipment installed onto it. It is possible to carry out both normal operation and TeleOperation with the same machine. With TeleOperation remote control, the operator has the same real-time control of the remote excavator and with the same high level of accuracy. 3D machine guidance, real-time diagnostics and a full gauge display are all available at the TeleOperation control booth. The new TeleOperation system is ideal for operating excavators in dangerous applications such as industrial waste disposal, involving hazardous, toxic or radioactive substances. It is also useful for earthmoving applications, and work on collapsing waste piles and in areas where there are buried mines and other munitions.